A market town in Wiltshire has announced it is twinning with a city in North Africa. Trowbridge, with a population of 40,000, has joined up with Oujda - which is 10 times bigger and the eastern capital of Morocco. Moroccans in Trowbridge are the biggest ethnic minority group in Wiltshire and many originated from Oujda. The link is the brainwave of the Moroccan Community Association, which hopes it will improve relations. Former chairman of the association Jalali Bettioui said: "We asked the town council and they agreed to the link. "We hope to improve relations between the two places. We are very pleased." Representatives from the local authority in Oujda, including the chief executive, have already visited schools and factories in Trowbridge and attended the Mayor's civic dinner in March. The proposed charter has already been agreed and representatives from the council are due to visit Oujda after Ramadan to finalise the link. Councillor Mary Stacey said: "It was a joint effort. We were interested in a link with a town in Morocco as that's where a lot of our residents have come from. "I think it's a very good thing. It helps to dispel prejudice and misconceptions and it promotes friendships internationally." One of the first events planned is a youth football match. Moroccans moved to the area in the late 1960s to early 70s as economic migrants to work in the Ross Chickens factory. 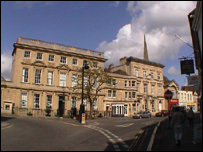 They originally moved to Somerset along with Italian and Spanish workers to fill the labour gap. Trowbridge is already twinned with Leer in Germany, Charenton-le-Pont in France and is part of West Wiltshire districts twin with Elblag in Poland.